We have been so busy here, it has been difficult to find time to work with StorageCraft's ShadowProtect products that we received in our Reseller Kit last month. One of our virtual XP Pro desktops has maxed out its VHD capacity. This is a mission critical desktop, so we are looking to the ShadowProtect Workstation Edition to remedy the problem. This particular process is called a V2V, that is Virtual to Virtual. We will be creating an image from the original Virtual Hard Drive (VHD) and then restoring that image to a new larger VHD. We started by booting from the ShadowProtect Workstation Edition CD. We are greeted by an option menu that defaults to booting from the hard disk if no key is hit. So, after choosing to boot into the StorageCraft Recovery Environment (SRE) with Standard Drivers, the process was pretty simple from there. We accepted the option to have network connectivity established in the SRE. This option is the timed out default for the SRE. Once into the SRE, we were able to click on the Network Configuration link and establish a mapped drive to one of our server shares by entering a domain UNC, a username, and password. We then created a backup image of the VM and stored it on the network via the mapped drive with the Backup Wizard. The image creation process took about an hour for around 30 GB. Performance will vary by CPU and storage medium. In the Virtual Server 2005 management console, we created a new Dynamic VHD, detached the existing VHD, and attached the new VHD. We then booted the VM into the SRE again, and set the network configuration to connect to the share where the StorageCraft image is stored. Once that was done, we started the Restore Wizard. When restoring the image, the new hard drive will not be formatted, so in the partition chooser one will need to right click on the new VHD and create a new partition with all available space. Miss that step, and ShadowProtect will insist that a partition be created first. The partition chooser will be similar to the Backup Wizard's partition chooser above. If the Undo Disks feature is enabled on the VM, turn it off before beginning the restore operation. One can enable the feature again after the process has completed. The whole process from start to finish took a couple of hours and it was successful! We now have a fully functional VM with increased space on its VHD. I don't know if I'd classify that as V2V. Real V2V is where you are moving a bootable Windows volume from one type of VM to another VM with different hardware configuration. For instance, migrating a Microsoft Virtual Server VM to a VMware VM. 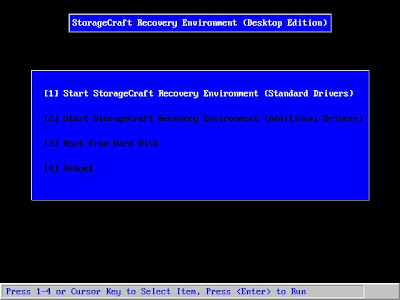 StorageCraft's IT Edition 3.0 has a feature called Hardware Independent Restore (it's just a simple checkbox in part of the restore wizard - really nice) which makes such a migration possible. 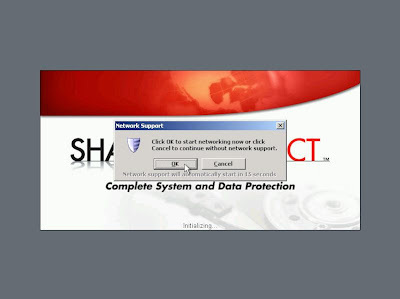 In fact you can use ShadowProtect IT Edition 3.0 to migrate from/to any type of machine, be it physical or virtual. I've used it successfully migrating VMware VMs to Microsoft VMs, the reverse, VMs to physical machines (V2P) and physical machines to VMs (P2V) as well as many physical machines to other physical machines, even if they have completely different hardware configurations such as different storage host bus adapters, chipsets, cpu(s), etc. Its super easy to use and very effective. I believe that in the strictest sense, yes, you are correct.